Have you ever burnt yourself while trying to achieve the perfect hairdo? I have! Just the other day I had a mishap with my flat iron. Ouch! For about a week after I had this terrible red mark on my neck and everyone kept asking me what happened. Fortunately it didn't leave a scar but I do have a scar on my wrist from when I was younger and burnt myself with a clothes iron. Let's face it ladies, it happens. Whether it's a slip of the curling iron on your forehead or like me you misjudge the distance between your hair and skin. Sometimes it hurts to be beautiful and a scar is left to prove it. ScarAway has a solution for these nasty wounds that cause even the tiniest of scars. 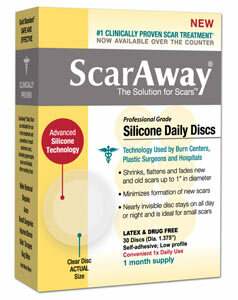 Their ScarAway Silicone Daily Discs are made especially to help shrink, flatten and fade small old or new scars caused from mole removal, biopsies, acne, surgery and burns. They are easy to apply and are nearly invisible. They are latex and drug free, made from professional grade silicone and recommended by doctors. These are great to have in your medicine cabinet should a minor mishap arise. You can purchase a box of 30 discs for $24.99 at your local CVS, Rite Aid and Walgreens store. Stay tuned for a ScarAway giveaway shortly!